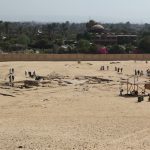 Archaeological exploration in 2012 and 2017 brought to light evidence for a hitherto entirely unknown temple complex. 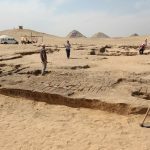 It was discovered at the eastern edge of the Czech concession at Abusir, in an area that forms a natural transition between a terrace of the Nile and the floodplain. The complex of 32 × 51 m in ground plan was entered through a large mud brick pylon. Behind it was a large forecourt from where one could proceed directly into the stone court, but also into two identical and considerably long storage buildings that enclosed the right and left side of the complex. Given the archaeological evidence, it can be assumed that stone column lined the side walls of the court which was enclosed by mud brick walls that were, however, at least at some places, painted blue. From the rear end of the court, a ramp or perhaps a staircase gave access to an elevated stone sanctuary whose back part was divided into three parallel rooms. The remains of this building, which constitutes the very core of the complex, were covered by huge deposits of sand and chips of stone of which many bore fragments of polychrome reliefs. These finds constitute a priceless source not only for the reconstruction of the decoration programme of the sanctuary, but also of the function and dating of the entire complex. Based both on textual and iconographic evidence, the structure is to be dated to the New Kingdom, to the reign of Ramesses II (ca. 1279-1213 BC). 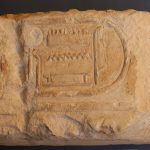 His name and royal titulary are attested among the excavated relief fragments. So far, relief fragments connected to cult of solar deities (such as Ra, Amun, and Nekhbet) and royal authority (the king and the god Horus) have been recognized. A construction of this type corresponds to the building programme of the above-mentioned king in the Memphite region, however, this is the only archaeologically attested temple of the king in the necropoleis of Abusir and Saqqara. The temple itself fits well both the state ideology of Ramesses II and the local traditions, stressing the cult of the sun. 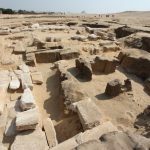 It is the presence of the temple in the Abusir-Saqqara region that can shed more light on their importance for religion and ideology during the New Kingdom. According to the director of the Czech mission, Prof. Miroslav Bárta, the discovery of this temple of Ramesse II. provides a unique evidence on building and religious activities of the king in the Memphite area. At the same time, it shows the permanent status of the cult of sun god Ra who was venerated in Abusir from the Fifth dynasty onwards and whose cult gained again on importance during the discussed period. Fig. 1 General view of the excavated area, (c) Czech Institute of Egyptology, Faculty of Arts, Charles University, Prague. Fig. 2 View of the entrance pylon of the temple with Abusir pyramids on the horizon, (c) Czech Institute of Egyptology, Faculty of Arts, Charles University, Prague. Fig. 3 View of the temple looking south, (c) Czech Institute of Egyptology, Faculty of Arts, Charles University, Prague. Fig. 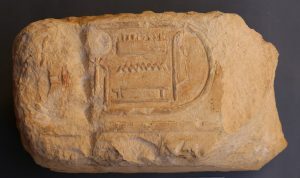 4 Cartouche of Ramesse II, (c) Czech Institute of Egyptology, Faculty of Arts, Charles University, Prague.